OK. Let’s take a break from talking about stone and talk about jazz. Heck, let’s take a break from everything and listen to jazz. How about LIVE jazz? And, well, the admission is FREE. Dean McNeill, a University of Saskatchewan professor and International Music Camp teacher, will be among the performers on Friday. If you’re interested, gas up the car and head to the International Peace Garden on Friday evening. That’s where the faculty of the Music Camp‘s jazz week will be playing a concert. 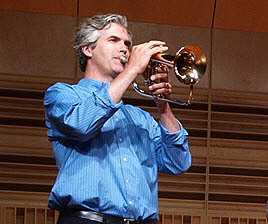 In all, 17 professional musicians — 5 trumpets, 5 saxophones, 3 trombones, guitar, drums, piano and bass. The band makes gorgeous music. All the details are in this story, which ran today in the Brandon Sun. Too tired to read? How about listening to this story from Prairie Public Radio? The Peace Garden and Music Camp are about 30 miles from the Stone Bank. OK. Now back to the Stone Bank. You really didn’t think we weren’t going to talk about the Stone Bank, did you? We’re jazzed to celebrate the beginnings of our stone building — the project began 112 years ago this month.We’d love to get a few birthday cards with checks inside. How about a symbolic $19.00 donation to mark the year that the construction started? Or $112 for every year that the Stone Bank has been standing. Now, that would be totally jazzy! 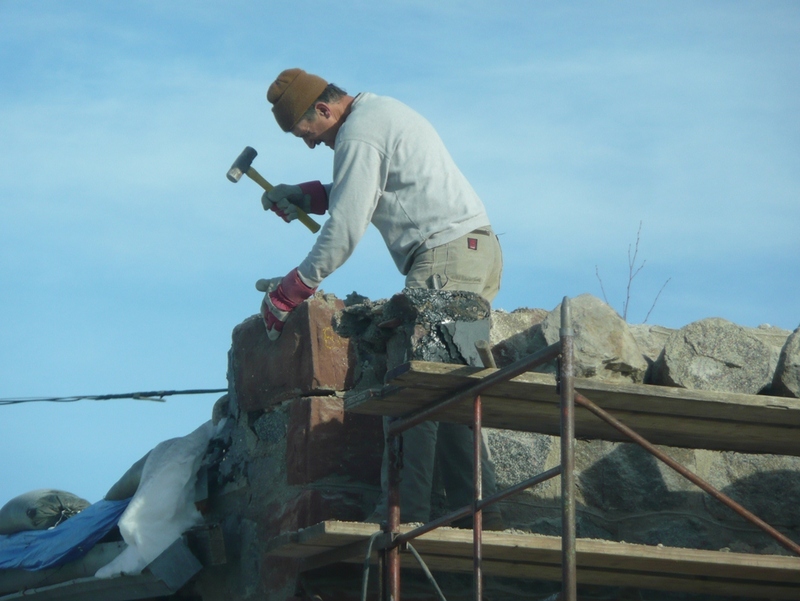 Stone mason Joe Whetter worked in the cold last fall to dismantle part of the Stone Bank. He is ready to put it back together — but we need the money to pay him. Can you help? We’ve got a PayPal link on this page — and/or you can mail your well-wishes to 524 Main Street in Bottineau, ND 58318. See you at the Peace Garden on Friday — and thanks for reading the Stone Bank Blog! Another great quote etched in limestone at the Peace Chapel at the International Peace Garden. Isn’t this a great quote? The Peace Chapel at the International Peace Garden never ceases to inspire. 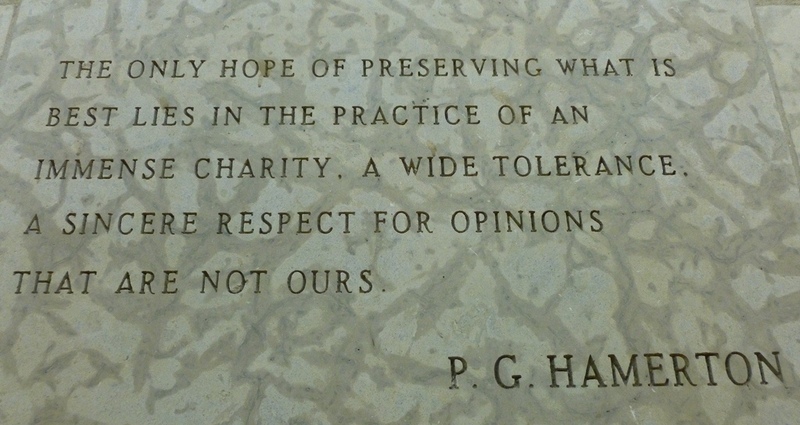 Depending on my mood or the day or current events a different quote strikes me as “more” meaningful on every visit. At the Stone Bank, we are working to raise $40,000 to help raise (rebuild) the back of our building this year. It’s as simple as that. We think the Stone Bank is “the best,” and we are working hard to keep it standing for another 112 years. We could use “immense charity” to get going on this year’s work. Remember, the Stone Bank is a 501(c)(3) tax-exempt organization — so your contribution is tax-deductible. Want to review earlier quotes? Stone Quote #1 and Stone Quote #2. Want to make a donation? Click the DONATE NOW icon in the right column. Or send a check to Touchstones, Inc., 524 Main Street, Bottneau, ND 58318! 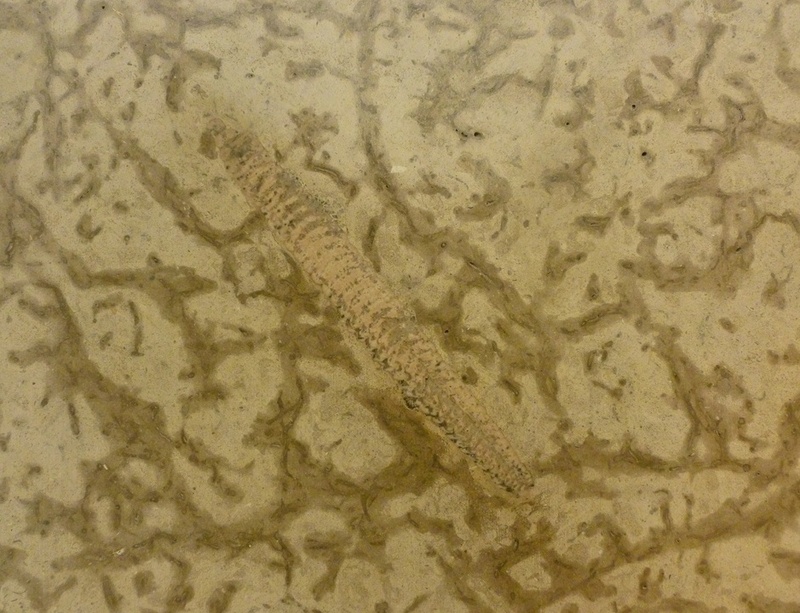 Fossil embedded in limestone panel at the Peace Chapel at the International Peace Garden.